Kick off your visit on the 11th (Fri): explore the activities along Beas River, then appreciate the views at Solang Valley, then admire the sheer force of Jogini Waterfall, and finally take in the spiritual surroundings of Hidimba Devi Temple. Here are some ideas for day two: take in the spiritual surroundings of Himalaya Nyingmapa Buddhist Temple, then take in the awesome beauty at Keylong, then hike along Lamadugh Trek, and finally indulge in some personalized pampering at some of the best spas. For other places to visit, traveler tips, where to stay, and tourist information, read our Manali trip itinerary planner. Pendleton, USA to Manali is an approximately 35-hour flight. Due to the time zone difference, you'll lose 13 hours traveling from Pendleton to Manali. 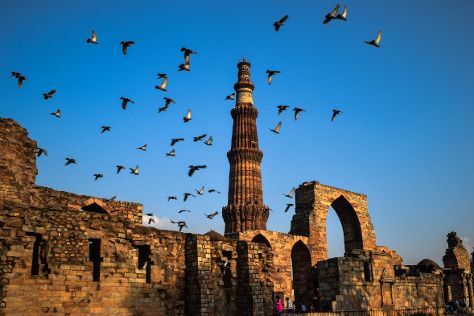 Finish your sightseeing early on the 12th (Sat) to allow enough time to travel to New Delhi. New Delhi is known for historic sites, parks, shopping, museums, and fun & games. Your plan includes some of its best attractions: take in nature's colorful creations at Humayun's Tomb, admire the landmark architecture of Rashtrapati Bhavan, explore the historical opulence of Red Fort (Lal Quila), and contemplate in the serene atmosphere at Gurudwara Bangla Sahib. For ratings, traveler tips, more things to do, and other tourist information, you can read our New Delhi trip itinerary planning site . Fly from Manali to New Delhi in 3.5 hours. Alternatively, you can do a combination of taxi and flight; or drive. In October, daytime highs in New Delhi are 93°F, while nighttime lows are 69°F. Finish your sightseeing early on the 15th (Tue) to allow enough time to travel to Varanasi. Kick off your visit on the 16th (Wed): contemplate the waterfront views at Ganges River, then don't miss a visit to Dasaswamedh Ghat, and then get the lay of the land with Walking tours. To see traveler tips, maps, photos, and other tourist information, you can read our Varanasi trip itinerary site . You can fly from New Delhi to Varanasi in 3.5 hours. Alternatively, you can drive; or take a train. Expect a daytime high around 90°F in October, and nighttime lows around 72°F. Wrap up your sightseeing on the 16th (Wed) early enough to travel to Agra. Spend the 19th (Sat) on the rails with a train tour. Next up on the itinerary: admire the striking features of Taj Mahal, let your taste buds guide you at a local gastronomic tour, make a trip to Jahangir Mahal, and look for gifts at The Warehouse of Gifts & Souvenirs. To see reviews, maps, other places to visit, and more tourist information, use the Agra trip itinerary builder app . Traveling by flight from Varanasi to Agra takes 2.5 hours. Alternatively, you can drive; or take a train. October in Agra sees daily highs of 94°F and lows of 68°F at night. Cap off your sightseeing on the 19th (Sat) early enough to travel to Leh. 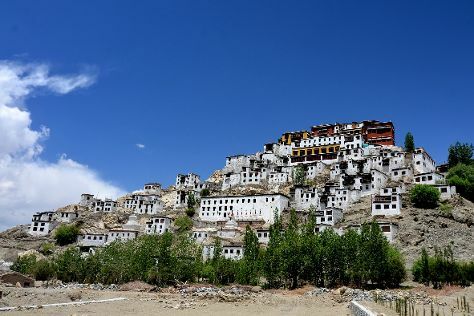 Leh is known for historic sites, nature, museums, wildlife, and adventure. Your plan includes some of its best attractions: contemplate in the serene atmosphere at Thiksey Monastery, make a trip to Confluence of the Indus and Zanskar Rivers, examine the collection at Stok Palace Museum, and relax and float downstream with a rafting and tubing tour. To find photos, more things to do, maps, and more tourist information, refer to the Leh itinerary planner. You can do a combination of train and flight from Agra to Leh in 5 hours. Other options are to drive; or do a combination of train, taxi, and bus. Wrap up your sightseeing on the 22nd (Tue) to allow time to travel back home.